Visit the QuickCPM Forum for more..
quickCPM provides a very small and lightweight monitor for your GMC-320 Plus geiger counter (left). Chances are it will work with other models but you will need to test for yourself. A few users have also used QuickCPM to upload their stats to the world radiation map. Track the radiation levels around your house, you may be surprised. quickCPM.py basically loops a call to the gmc320 and displays it to the screen. Each pass then writes/updates the CMB and Temp record to a file for storage in the format gmc_YYYYMMDD_cmb.csv, temperature scvfile ending with _temp (see below) . It then combines the results into two linked html files that you can view in a browser locally or display from a web server using the new ftp upload feature. (Completed qcpmmonthstats.py) iframe: Analysis Overview of data. 2018Aug25- Created yearly log analysis script qcpmyearstats.py. You can run this with the month stats and it will compile all of the month stats into a year overview. I have not included it in the zip file yet, you will have to download it seperately. 2018Apr08- Uploaded ftp version. You must set ftp variables in beginning of script or turn off ftpOn variable. 2018Apr07- Added upload library. Allows upload to website. (above) Upload cycle variable, above set to upload every 90 cycles. 2018Mar11- Updated gauges to use scripting over static html. Added bar/gauge button on each page to switch between the two. 2018Mar10- I have added a new output file that is gauges only. The file is called simply gauges.html. It uses gauges.min.js file from https://canvas-gauges.com which appears to be an awesome gauge set and fairly simple to set up. Image is below. This will come in handy for small devices like pi zero. 2018Mar07-Updated to use a log dir. You must create the dir before using.. just /logs where you run the app from. I will do a dir create on the next update. I also updated the html output. 2018Mar05-Changed date format in csv. Now registers temperature in seperate temp.csv file. Changed output to include peak monitor. 2018Mar04- Added CRs to csv output. Csv file should be in correct format now. 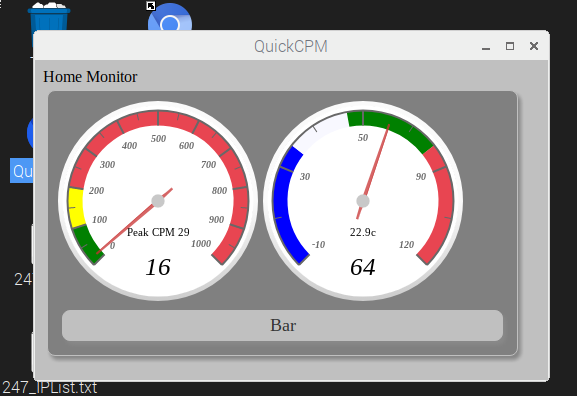 Download quickCPM.zip below on your Raspberry Pi. I believe the serial library comes with raspian base install, if not you will have to google search install. 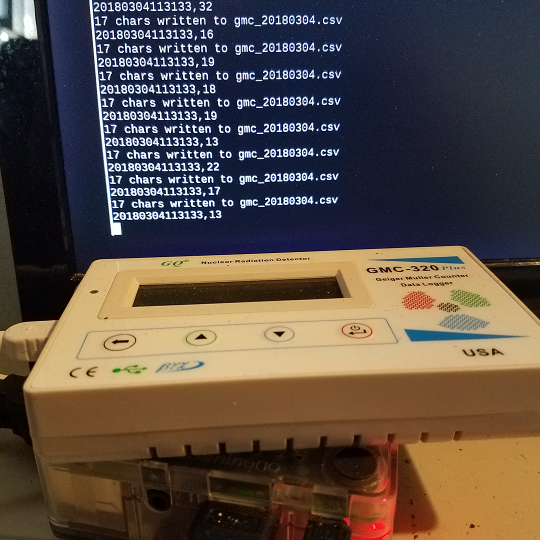 I will try it with a fresh Raspian install and update this post. Where 60 is the refresh cycle time in seconds. If you omit this, it will use 300 which is 5 minutes. Your files will appear under the logs directory and the index.html will be built in the location you launched the program from. Once you have the desktop file on your desktop, right click on the desktop file and select properties. (where --app=path from your browser to the index.html file or gauge file) Set working directory to that same directory path (not sure if required). Set the description and Tooltip to something cool like quickcpm rules! If you want, put it in your boot up to open when machine boots. So it appears that the only way I can connect to my security cameras requires active x. This means that I will probably need to rewrite this in c# and use windows core on pi for my home monitoring. I am more comfortable with c# but that also means I have to rethink the entire deal. Not to sure on running python on windows core but it may be an option. This is why every little thing takes forever in the coding world.. haha. Probably more to come. This will allow you to launch it each time. Note the log dir will change. This is easily fixed (which I may just add to the py file anyway) to change to the working dir you establish in the beginning of the file. directly after (or somewhere after) the workDir variable. This will cause the script to change to the workDir before running. You can have quickCPM start on boot if you make a copy of this desktop file to the /home/pi/config directory. You may have to turn on view hidden in file manager or copy it via the command line.